PENNY McCORMICK discovers a burgeoning spa scene in Northern Ireland. There’s a real buzz about Belfast these days. Undoubtedly since the Titanic Museum opened in 2012 the city has drawn a lot of visitors but so too have fans of Game of Thrones been flocking to Northern Ireland. 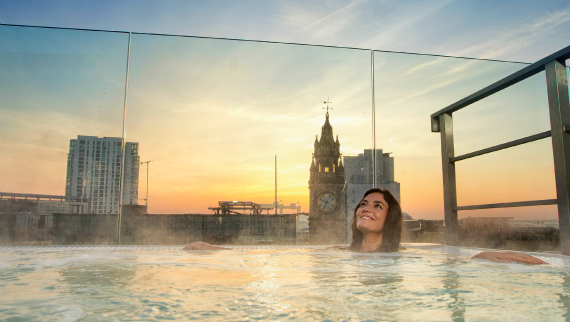 Central to the renaissance of Belfast’s tourist scene has been The Merchant Hotel which offers boutique-style accommodation, a thriving Afternoon Tea scene as well as late night jazz bar and also a luxe spa opened four years ago. I stayed in the hotel (a converted bank which blends Victorian and Art Deco details seamlessly) in its early days but had not been back to sample the delights of the spa (it being booked to capacity on several enquiries). It’s certainly a deceptively large space – with a reception at ground level featuring a Champagne Nail Bar, which leads down to an impressive thermal and hydro area (with Rock Sauna and Aroma steam room) as well as several treatment rooms for both men and women. The lighting is subtle as is the music and the idea is to restore well-being as well as literally shut out reality. The dark lighting helped although I did have trouble finding my way back to the changing area; clearly deep relaxation affects my sense of direction! 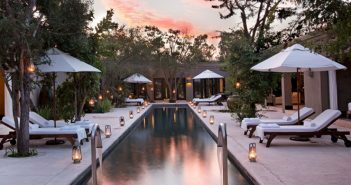 There’s a separate male menu comprising facials, massages and manicures, while for women you can opt for Merchant signature treatments or those by Deborah Mitchell (of Heaven Skincare fame) and Darphin. The Spa also provides an extensive range of options from Kerstin Florian. Not having tried a Darphin facial before I opted for this and was not disappointed. Julie, the therapist, was very informative about the products as well as the history of the brand. The Darphin legacy began in 1958 when Pierre Darphin opened his Beauty Institute in Paris. He had a passion for botany – hence the nourishing oils and plant-based products which are so on trend, despite being 50 years in the making. Although there is no extraction in a Darphin facial the process of cleansing and exfoliation using the Mild Aroma Peeling is incredibly effective before a thorough facial massage (I had the Orange Blossom oil for mine which is focussed on brightening the complexion). Pierre Darphin firmly believed that beauty treatments require a specific massage technique to enhance their delivery into the skin and it’s often been said that Darphin therapists have ‘magic fingers’. Julie’s were no exception as specific movements, pressure points and rhythms were established to help with lymphatic drainage. The facial massage delivers a natural facelift before the mask is left to work into to the skin plumping, firming and moisturising all in one healthy shot. An arm, head and hand massage accompanied the treatment which all added up to a sense of luxuriousness. Afterwards the Hydraskin Intensive Skin Hydrating Serum and Smoothing Eye Gel were lightly applied, leaving my skin feeling and smelling lovely. To complete the pampering afternoon I enjoyed a glass of Prosecco in the relaxation area and caught up on some glossies. It’s a shame I had to get up and get dressed. Next time, I’d probably book into the hotel – it’s recently been named as Northern Ireland’s best hotel by the AA. What’s not to like? Need to know: Darphin Facials cost £60. Guests can also book full day or half day packages. The spa can also be booked for private use and parties. As well as providing treatments, champagne and canapés, a buffet meal and music are all part of the private use packages.